Posh man-of-the-match Michael Smith saw this shot at goal blocked by the Oldham defence. Photo: Joe Dent/theposh.com. Right-back Michael Smith was a deserved winner of the sponsors’ man-of-the-match champagne as Peterborough United were held to a 1-1 League One draw by Oldham at the ABAx Stadium today (March 18). Smith almost scored in the early stages and looked an attacking threat from the right flank. 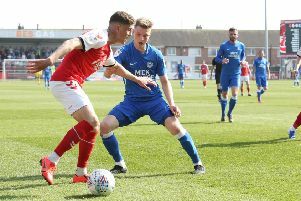 Posh skipper Chris Forrester gets away from Oldham's Aiden O'Neill. Photo: Joe Dent/theposh.com. Midfielder Anthony Grant and substitutes Marcus Maddison and Junior Morias also performed with credit. Impressive Posh midfielder Anthony Grant during the 1-1 draw against Oldham. Photo: Joe Dent/theposh.com.